Description: The Bookshelf Series is small enough to fit anywhere in your home. 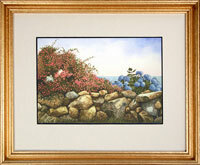 It is an open edition reproduction from an original painting by Cape Cod artist Timothy Jon Struna. This image is available in a notecard of heavy cardstock (4.5 x 6.25 inches) with a light grey envelope. See - Select an Option!